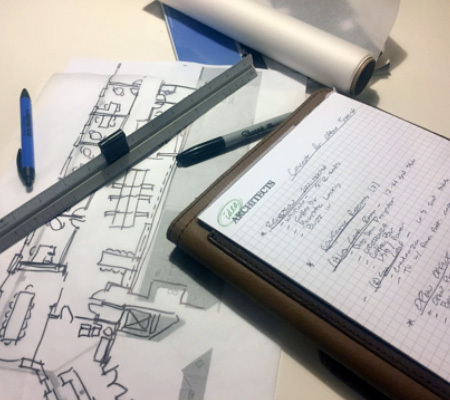 Hiring an architect may seem like a daunting task, but the process should be fairly simple. The first question people usually ask is, where do I start? In our opinion the best place to begin is to ask for referrals from friends, family members, co-workers, neighbors, etc. - anyone whose opinion you value that has recently completed a construction project. Another good resource for referrals would be contractors, real estate agents, brokers, developers or anyone you may know in the construction industry that works with different architects. Even in this digital age when so much information is available online, there really is no better way of selecting an architect than by personal recommendations. Another good source is to look at professional organizations such as the local AIA (American Institute of Architects) chapter. Professional organizations will undoubtedly have many different and qualified firms to choose from. With that in mind one might wonder what do I need to ask or what do I look for in prospective firms to narrow down the field? There are some things to keep in mind during your search. The firm's profile on their local AIA chapter (or other professional organizations) website. There are trade shows for firms specializing in a specific market segment, such as the Home and Garden shows (residential type projects). Firms in attendance at these trade shows will typically have brochures, fliers, portfolios, etc. prospective clients can get a better understanding of the type of projects the firms have done in the past. Look at the projects that are similar to yours, but also those that are not. Look at the architect’s whole body of work. What kind of reaction does his or her work evoke from you? Do you like most of their work or not? Does the architect have a similar style or a signature aesthetic that has a recurring look from project to project? If they do is this desirable? Does the architect have a good reputation? See if any complaints have been filed against them. It is very easy to do research online, such as searches from organizations such as the Better Business Bureau or state licensing boards. If any complaints are found, look into them. See if the issues have been resolved. Another thing to consider is the stability of the company. How long has it been in business? III. Another important aspect to consider is not business related or even technical in nature, but that the architect and the client should have a good rapport. Aside from the technical competence and creativity, you will be working closely with the architect that you select for some time so it is imperative that you and your architect’s personalities are well suited to one another. In our experience the most successful projects tend to be more collaborative in nature. IV. One more thing to keep in mind is that you are the expert on your needs, not the architect. You are the one who ultimately understands how your project needs to function and/or look. When you combine your expertise about your needs with a creative and technically proficient architect, the sky is the limit. The most important thing your architect can do for you is to listen to what you need first, and only then can they come up with design suggestions to help satisfy your programmatic needs in a creative and evocative manner. We always encourage people to do as much research as possible to make their decisions. Who from the architectural firm will you be working with directly? Will the same person you originally met with be designing the project? If not who will be designing the project? Who will do the production work on our project? How familiar is the architect with the municipality and the municipal process? What will the architect show you along the way to explain the project? Will you see models, drawings, or sketches? Does the architect have contractors they would refer or will they work with one that has already been selected? What services does the architect offer during construction? Do you have a list of past clients that your firm has worked with?